Find My Workspace lists over 95% of the executive office suites market in Alexandria (Virginia). Simply click Request Quote to check pricing for one office, or Add to Basket for multiple offices. This center has a professional profiled work environment complete with all the amenities to keep you growing and creative. Leverage our work environment to increase your company’s output. Plug-in & GO! by the hour, day, week or month. This center are flexible and motivated! This center have options that work with every budget and solutions that fit your goals! This extremely professional and exceptionally well equipped premium business center location is one of the foremost and most highly prestigious business installations in the region, with an extensive variety of on-site facilities and high quality provisions available at very competitive rates. This business center is the ideal setting for prospective tenants in search of value and an exquisite professional location and vibrant, engaging working environment that is highly conducive to productivity. The site can cater for any type and level of corporate workspace requirement, being perfectly suited for tenants from any background or industry. Each fully-furnished office comes equipped with 100 Mbps fiber internet and WiFi at no extra cost. Work from the privacy of your office or suite, or mingle with other entrepreneurs in one of the beautiful amenity spaces featuring communal lounges, espresso, and a kegerator with local brews on tap. At this center, all utilities and taxes are included in your rent, as is mail and package delivery service, 24/7 keycard access, and your company logo displayed outside your office. From dedicated desks for solopreneurs to office suites for larger companies, this space provides everything you need to grow your business. 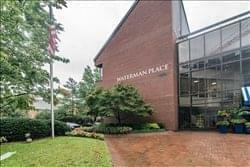 Waterman Place is a beautiful Class A building with convenient in-building parking, an on-site fitness center/locker room and a community cafe, all of which is fantastic options for those on site looking for a break. In addition to the virtual services available, Waterman Place offers 24/7 access to great meeting space, event space for 100+ people and professional offices. Find what center is best for you and your team and stop in today. You can enjoy the amenities such as, break lounge space, meeting rooms and high speed Wifi. Enjoy the flexible terms and the Administrative support by the on-site team.